Here are more details and exclusive images. 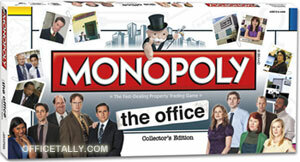 This new take on the classic MONOPOLY® game transforms the traditional game board properties into popular locations in “The Office” such as Dunder Mifflin Scranton or Michael’s Condo. In addition, players might land on “RUDIT-DIT-D’DOO!” (Community Chest), “That’s what she said!” (Chance), Donation to Rabies Fun Run (Luxury Tax), or Buy a Hug from Phyllis at Crime Aid Auction (Income Tax). Follow The Office Monopoly and The Office Clue games on Twitter at @PlayTheOffice! Aw, can’t believe there’s no stapler in jello. Would have liked to see a Dundie there too! All I know is, if Andy’s Banjo is in this game and NOT Jim’s Can of Tuna I am going to lose it. Basically all I am saying is, VOTE FOR THE CAN OF TUNA! I knew this was only a matter of time. Can’t wait. Looks great :)Will it be available in Canada as well? Are all the spaces going to be Scranton locales mentioned on the show? That would be awesome. Tanster- you need to get an interview with one of the game developers like you did with the Clue game! The Office Olympics medal looks nothing like the one in the episode! =( Definitely hoping that doesn’t make it in. I agree about Pam’s candy dish being the better candy container as well!! There NEEDS to be a Dundie, I can’t believe that isn’t an option. I agree that a mound of Jello would be nice too, classic. The only thing I have to say is the Princess Unicorn doll needs to NOT be in the game. Ok, the option should be for 1 or 2 because you HAVE to have the mug, Dwight’s Bobblehead and the candy dish, and MAYBE Andy’s banjo, but the last ones should be the grill and the can of Tuna, but I dunno, we’ll see. The “World’s Best Boss” mug for sure! It’s so funny, I just assumed there would be a Dundie. I would love for none of the Clue items to be repeated. Those of us hardcores are likely to buy both games and it’s easy to just transfer pieces from Clue to Monopoly. So take out the mug and leave out the Dundie. The Dundie and the stapler in jello were not selected by to be in the lineup since the Dundie already appears in the Clue game, and it was decided that the stapler in jello wouldn’t work out visually since you cannot show transparency in metal. The list that makes up the poll is the final list of approved tokens and only six tokens total out of this list can appear in the game, which is what we are asking the fans to choose. Thank you for being so good in responding to us, TheOfficeNBC!!! The only ones that stick out on the list as “out of place” are the princess unicorn and rabid bat. Everything else seems more “office-y” to me. My six would be mug, bobblehead, pam’s jar, grill, banjo, and tuna. Michael’s train whistle would have been funny, and something from the warehouse (box of paper) would have been appropriate! Just got my Office Clue Game yesterday! I can see not wanting to have the same pieces in that as in the Monopoly version. I picked Andy’s Banjo as one, and I would actually pick Princess Unicorn – I’ll probably end up playing this game with my 12-year-old niece and she’ll definitely want to be Princess Unicorn (given the choice between that and a can of tuna)! The currency is going to be Schrute Bucks, right? I just think there are better items to choose from The Office episodes. For instance, if they couldn’t make the stapler in jello because of the transparency, then how are they going to show transparency on pam’s candy container? Also, it should have been a tuna sandwich instead of a can of tuna. How come you didn’t put in Kevin’s tissue box shoes or Stanly’s crossword book? This is going on my birthday list! why not use the anthracite museum? I just don’t understand-and why aren’t they using Sabre considering the buyout?? Mindy, you own all current Office board games, right? 1) trivia, 2) DVD trivia, and 3) Clue? Has the rabid bat ever been talked about other than in Fun Run? @Dilllllon The bat was one of the main storylines in Business School from Season 3 directed by Joss Whedon. great episode. I’ve already pre-ordered!! I can’t wait to play it with my nephew. He’s loved playing The Office Clue with me,although he had never played any type of Clue game so the rules were unfamiliar. He’ll absolutely love playing The Office Monopoly. Plus I get to teach him more about my favourite show!! Now just waiting for the Jim bobblehead to come out and my Summer will be complete. I just got my Office Monopoly game today. I will be playing it later and can’t wait to teach my nephew more about my fave show and characters!! Does anyone know the store release date for the game? I tried looking online but couldn’t find it anywhere.